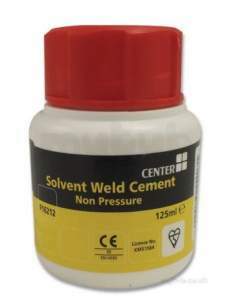 UPVC solvent cement for a variety of uses. First class service, items delivered on exact day stated. Having been without a boiler for several days, had the runaround from a well known national gas company and a wife threatening to divorce me and emigrate back to her homeland, your swift supply of a part, which mysterious the aforementioned gas firm couldnt source, was extremely appreciated. In particular, I would like to commend Christine for her help and the urgency she clearly demonstrated. Without her actions we might still be shivering and by now slightly smelly. With everything back to normal, the one downside is I get to keep the same mother-in-law! Why choose MyTub Limited for center tin solvent cement 125 ml 6304274?